Remind me again why the west needs a carbon tax? | Watts Up With That? Remind me again why the west needs a carbon tax? The following calculations and graphics are based on information on worldwide national CO2 emission levels published by BP [i] in June 2013 for the period from 1965 up until 2012. The data is well corroborated by previous datasets published by the Guardian [ii] and Google up until 2009 [iii]. The European Union, (including the UK), believers in action to combat Global Warming. Japan, the former Soviet Union, Canada and Australia are developed nations, ignoring Kyoto. Korea, Iran, South Africa, Mexico, Saudi Arabia, Brazil, Indonesia and Taiwan: developing rapidly. China and Hong Kong: developing very rapidly. Rest of World (~160 Nations): developing rapidly. 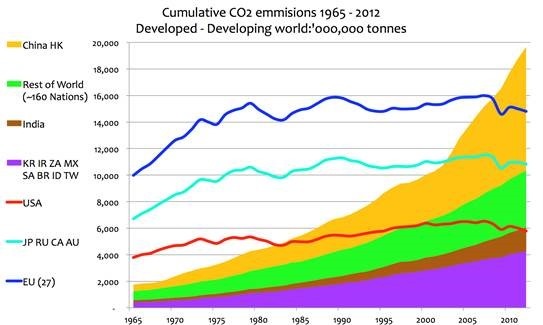 CO2 emissions from the developing world as a whole overtook the developed world in 2007 and are now ~42% higher. There has been a very rapid escalation of Chinese CO2 emissions since the year 2000[iv]. China overtook the USA CO2 emissions in 2006, and by 2012 Chinese emissions were already ~60% greater than the USA, the escalation in Chinese CO2 emissions will continue. The stabilisation or reduction of emissions from developed economies. The USA, simply by exploiting shale gas for electricity generation, has already reduced its CO2 emissions by some 8% in the last year[v]. 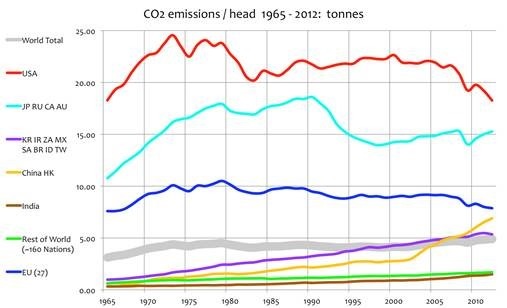 That alone has already had more CO2 emission reduction effect than the entire Kyoto protocol[vi]. There is inexorable emissions growth from all the developing economies, from a low base. India has accelerating emissions[vii], growing substantially, from a low base. So any CO2 emissions reduction made by the Developed Nations will be entirely negated by the increases in CO2 emissions from Developing Nations. However probably more significant than the total CO2 emissions output is the comparison of the actual emissions/head for the various national groups. 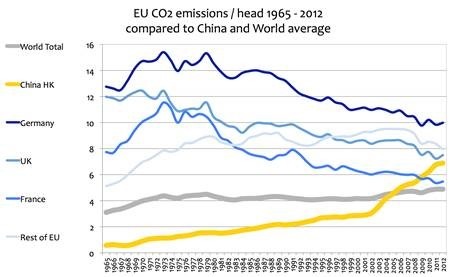 The EU(27) even with active legal measures have maintained a fairly level CO2 emission rate but have managed to reduce their CO2 emissions per head by ~29% since their peak in 1977. The recent downward trend is attributed to their declining economies. China’s CO2 emissions/head have grown a further 140% since 2000. China overtook the world-wide average in 2003 and surpassed the rapidly developing nations in 2005. India’s CO2 emissions have grown by 4.7 times over the period and are now showing recent modest acceleration. That increasing rate is likely to grow substantially. The Rest of the World (~160 Nations), 36% of world population have grown CO2 emissions consistently but only by 2.6 times in the period, this group will be the likely origin of major future emissions growth. Overall average world-wide emissions/head have remained relatively steady but with early growth in the decade from 1965. It amounts to 1.6 times since 1965. Chinese CO2 emissions at 6.7mt/head for its 1.3 billion population are already ~41% greater than the worldwide average. Those emissions are still growing fast. At 5.4mt/head, France, with ~80% nuclear electricity generation, has the lowest CO2. emission rates in the developed world and is at only ~12% above the world-wide average. China’s CO2 emissions/head exceeded France’s CO2 emissions/head in 2009. The UK at 7.2mt/head is only ~50% higher than the world-wide average and only about ~12% higher than China. Germany, one of the largest CO2 emitters in Europe, has emissions/head ~100% higher than the worldwide average and is still ~63% higher than China. If CO2 emissions really were a concern to arrest Catastrophic Anthropogenic Global Warming / Man-made Climate Change, these results show starkly the real advantage of using Nuclear power for electricity generation. This must question the Green attitudes in opposing Nuclear power. Following Fukushima, the German government position of eliminating nuclear power in a country with no earthquake risk and no chance of tsunamis should not be tenable. “the Developing World is not joining-in with CO2 emission reductions nor does it have any intention of doing so. The failure of worldwide action negates the unilateral action of any individual Nation”. Professor Fritz Vahrenholt again re-emphasised this point in a July 2012 lecture at the Royal Society [ix] [x]. As CEO of RWE Innogy, the major German windpower supplier, Professor Vahrenholt pioneered Germany’s significant advances in renewable energy, especially in the development of wind power. Previously Professor Vahrenholt had accepted the IPCC as the foundation of his understanding of mankind’s effect on climate change. However, as a trained chemist he re-examined IPCC reports in detail. He found many errors, inconsistencies and unsupported assertions. He has now entirely revised his position. His diagram below shows the miniscule effect of the enormously costly efforts at decarbonisation in Germany, (die Energiewende), in comparison with the escalation of CO2 emissions from the rest of the world. The underdeveloped nations are bound to become progressively more industrialised and more intensive users of fossil fuels to power their development and widen their distribution of electricity. The futility of the expenditure of vast resources on Green activities in Germany becomes clear. 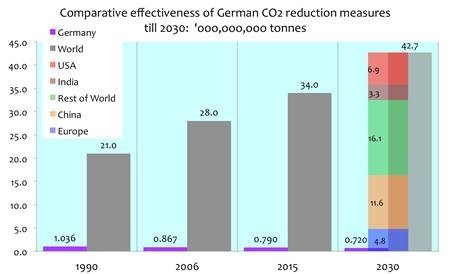 German actions with increasing risks to its energy security and the risk to the German economy as a whole, could only ever reduce Germany’s CO2 emissions by ~150,000,000 tonnes between 2006 and 2030. That would only amount to ~1/100 of the concomitant growth in other CO2 emissions from the developing world. According to Bjorn Lomborg the $100billion German investment in solar power alone, not including other renewable investments, can only reduce the onset of Global Warming by about 37 hours by the year 2100[xi]. 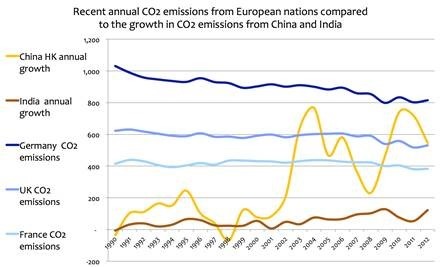 This point is re-emphasised by comparing the annual growth in emissions from China and India with the full annual emissions from key European countries. 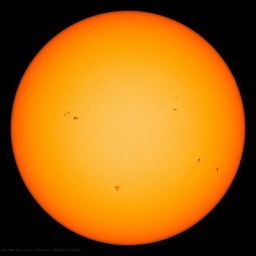 “The Neglected Sun: Why the Sun Precludes Climate Catastrophe”[xii]. ← At AGU 2013: Are tornadoes getting stronger? No. We need a carbon tax so we can atone for our sin of living a healthy, prosperous and long life. I reckon that after Richard’s comment, the whole comment section can be closed. It’s simply another tax, to enable Governments to spend our money how they seem fit. India, China, Brazil and South Africa have historically been in the position of making demands in the annual COPs, and their moral authority was exploited by UN agencies to fuel the negotiation process. As their own emissions grow however, they lose this position and it resembles the developed ‘North’ day by day. The moral authority of the BASIC bloc in requiring the West to make emission cuts is disappearing. Consequently the momentum in the negotiations will dissipate as well. Excellent charts. They really tell the story: the U.S. is decreasing its CO2 emissions, while China’s emissions are rising rapidly. Therefore, there is no reason whatever for a “carbon” tax in the U.S. And China certainly is not going to impose a tax on itself. The whole [unstated] rationale for such a tax is to transfer the country’s wealth, via much higher prices, into the pockets of government bureaucrats and into the irresponsible, unaccountable and opaque UN coffewrs. Anyone advocating a “carbon” tax is a treacherous fool or a self-serving tax-sucker riding the government’s gravy train — at the expense of hard working Americans. Enough! We do not need more taxes. We need LOWER taxes! Cutting carbon emissions very much reminds me of another left wing idea of a few decades ago, unilateral nuclear disarmament. The idea being that if we gave up our nuclear weapons the USSR would do the same. This was so unbelievably naive, the USSR would have annexed the whole of Europe. Likewise with carbon emissions and the developing world. China has an extremely strong economy, ours (UK) would be a lot stronger if we had the same cheap energy that China has rather than our self-flagellating reliance on expensive renewals. Of course China and India will not cut their carbon emissions, no-one in their right mind would, which just about sums up our political leaders. An increase in taxation is, I think, a reasonable starting point. Others disagree. In any case, the economic damage done by a tax is roughly proportional to the square of the level of the tax. Therefore, if you want to increase taxes, you should increase those taxes that are currently low (e.g., a carbon tax). If you want to keep taxes as they are, you should decrease those that are high (income, capital, consumption), and increase those that are low (carbon). If you want to reduce taxes, a carbon tax would still allow for deeper cuts in income taxes etc. Carbon taxes? They’re here already. Remind me again why do western electorates shun carbon dioxide taxes but get them anyway? A. The UN agenda 21, to which all, most [you choose which] the politicians in the Western democracies ie the EU and USA ‘signed up to’. Canada, Japan, Australia have woken up, we still sleep walk and they still impose carbon taxes. 1) What about Tax breaks for reducing carbon output. If we want to increase capital investment that permanently reduces carbon emissions, we will get more results with honey rather than vinegar. 2) Is the West’s carbon drop just a shift to China’s increase as they have evolved to be the cheap and dirty manufacturing wing of our economy? Some day they’re gonna run out of our money. If you want to keep taxes as they are, you should decrease those that are high (income, capital, consumption), and increase those that are low (carbon). If you want to reduce taxes, a carbon tax would still allow for deeper cuts in income taxes etc. Richard, this seems a little niave to me. In france and the rest of europe an increase in one tax will be spent immediately so they increase another tax and that gets spent so they increase another tax and that gets spent. There is no reducing one tax because you increase another. Europe is as close to communism as you can get without living in Cuba. Tax and spend = socio-communism. Some day we will run out of money, like Cuba. We will be on bikes because cars older than 3 years will be banned and there will no be enough disposable (in france imposable) income to buy anything. The Eu commisariat will be fine, thank you. Unless one is unfamiliar with ‘fuels’ and how or what the combustion process works or yields, I suppose a ‘carbon tax’ is a necessity, lacking, again, knowledge of fuels and the combustion process … otherwise a fuels tax make sense. The mechanism to collect and enforce that tax is already in place (no need to needlessly duplicate paper-shuffling bureaucracy). The point of a ‘carbon tax’ was/has (apparently) morphed out of a ‘carbon exchange’ scheme where additional ‘blood’ could be bled from the productive side of the system or house to the benefit of the ‘traders’ and those getting in on the ground floor of the Ponzi scheme. If you believe any guvment will ever reduce income taxes, I have a bridge in NY to sell to you. Don’t feed the beast. So the carbon tax in the West pays for China’s pensions and India’s infrastructure? Just what the UN and IPCC want! This possibility of conflict with China is real. It makes no sense for us to undercut our own economies and energy generation capabilities in the face of China’s all out push to develop their own. Richard Tol gives the game away. The real purpose of the carbon tax is to pay for the socialist entitlement state. Of course, what he doesn’t realize (or doesn’t tell us) is that the money will be spent to expand existing programs and create new ones, and not reduce the debt or deficit spending substantively. That has been the history of new taxes and increases in existing ones. We are told that the world will end in catastrophe unless carbon emissions are reduced to 350ppm so the politicians tax ‘carbon emissions’. If a large group of us were doing something like working on nuclear bombs that could lead to catastrophe of the type that CAGW is promoting; would the powers that be _tax_ us for doing it or would they take rather more immediate action? I put it to you that there would be rapid and insistent use of force to prevent us ‘destroying the world’. The very fact that the catastrophic AGW proponents will allow emissions to continue as long as the tax,is paid is proof that they do not believe in the catastrophe. So to answer the question of the post “Why does the west need a carbon tax?”. It is to enrich politicians, their friends and their bankers and to increase their power. As David Rose has shown the politicians are extremely adept at insider trading to their advantage even if it means the impoverishment of their countries. A carbon tax would be very unpopular amongst the voters as we have demonstrated here in Canada and it would be irresistable for whomever is in power to not keep increasing it to pay for their political pet projects. We have already seen what happens when professionals tamper with temperatures to try and prove their point the earth is getting warmer, do we really need politicians telling us how much worse things are so they can raise this tax forever? Better to nip the whole idea in the bud and severely punish politically anyone who advocates for this tax. No good will come from it whatsoever. I suppose you don’t include gasoline taxes as a form of carbon taxation, which, although not their original intent are now effectively taxes on carbon. Those are very high in my view, particularly in Europe. In fact, I don’t know of any taxes that are low at the moment. In America the new trend is toward piddling taxes, those little taxes that government is imposing on your phone bill, your water bill, or your tax bill from state, local or federal governments. The go by various names but usage tax or usage fee is one common description. We are being overwhelmed by them, particularly here in California. Of course I’m one of those who thinks government is ridiculously overlapping, inefficient, self-promoting, self-generating and increasingly authoritarian, so forgive me. Carbon taxes in the West also have a hidden affect: they increase costs of production and transportation of all goods that are manufactured, thus putting Western manufacturers at a disadvantage in world markets. Higher taxes buy more freebies and keep the populous apathetic, and that’s the prime objective as we go down. Carbon based fuel is taxed in Germany like this: Value added tax, mineral oil tax, eco tax. All in all 70 % of the price at the pump are tax. Inventing a carbon tax on top of it – that’s one we don’t have, we have the carbon credit scheme instead, but that’s not directly in the end consumer price – would be politically interesting only insofar as it looks like a small tax when in fact it’s just another tax hike. Make it look small by dividing it into a dozen taxes, fees and levies. When looking at economics I never care for the names of the taxes, just the relative size of the public sector part of GDP. Why would I want to keep track of every idiotic political ploy. What’s important is the size of the parasitic sector; for instance, never invest a dime in France, that’s a good start for a strategy. Under a well-run system in which taxes are fairly taken for benefits fairly received, we would not need a carbon tax. There would be enough money in the system to fund a new series of short-term projects – like the development of Green technologies – because prior series of short-term projects – like road or dam building, would have come to an end. Our world system of taxation is not well-run, not fairly taken nor result in benefits fairly received. The system is self-justifying as any empire-building, human-defended system elsewhere in our society. Wars: when you have standing armies, you have to send them somewhere. The French realised this when they sent the Foreign Legion out of France. The army will do something, for that is what it’s purpose is, and it would be better if it did that thing somewhere else (until it is actually needed at home or someplace in particular). Corporate lawyers and IT departments and accountants self-justify by finding where they can practice, and in so doing grow, prove their importance and generate trouble. The tax department finds and collects taxes. Those well-run tax departments find new monies, new ways to tax, new ways to get more money for their masters. And the masters find new things to do with their new money because, well, they want to do a “good” job, too, even if that does not mean a necessary or desired job. We are being taxed to death. Not the very rich, of course, who have avenues to avoid it (ask a Kennedy, a Gore or even a Suzuki or Michael Moore if you want to find dodges to keep working for you that green the rest of us give up each April). But it is not the level of taxation that is the real problem, the real problem is that it is not fairly taken nor generating fair benefits. And it does not target projects that come to an end with a tangible benefit that continues, but targets infrastructure (including institutional) that creates on-going, never-ending maintenance costs. The new tax never fixes a problem or establishes a presence that has an end. The carbon tax is going to go into general revenue like all other taxes. There is not a country in the world that says that the tax will go to a specific, identifiable and demonstrable item that can be directly verified for effectiveness. The green subsidies come from somewhere that does not have a measurable result that defines its existence: the taxes that go to it come from general revenue and cannot be specifically terminated because of non-success. Which means that whatever theoretical tax that is generated for the Green initiatives can be redirected to anywhere, at any time. So it would be with the carbon tax. It doesn’t have to do anything, achieve anything, to go forward, for it will be spent on whatever the governors want. Regardless of whether you agreed that that was what the “new” tax was for. In Canada, back in the 1980s, the government of the time created a national energy policy that included the creation of a national oil company, Petro-Can. The people paid for it, we were told, by a specific tax on gasoline. Petro-Can got paid for. Did the tax come off? Of course not. Petro-Can got sold back to the market. Did the taxpayers get a cheque in the mail? Of course not. The tax and the sale simply went to a general revenue account and were spent elsewhere on things that we had no say about except on the 4th year election day. We can always use a specific tax. But only when that tax is designated to specific, traceable programs that are time-limited and required to show effectiveness. And then the tax is removed. Fairly taken for benefits fairly received. But that is not how our tax system is built, and that is not how our government is designed, that is, not designed to be accountable for how it spends our money (or how it acts in general, actually). We do not need a Carbon Tax for the same reason we do not need any so-called target-denominated tax. There is no end to one, and there is no accountability to one as things are organized all over the world. A “carbon” tax is a ruse by skillful magicians on all us in the audience who they consider (rightly) to be rubes with money in our pockets. 2. I voted Democrat because I believe oil company’s profits of 4% on a gallon of gas are obscene, but the government taxing the same gallon of gas at 15% isn’t. Ironically, a carbon tax may increase emissions drastically, for the good of the biosphere at least in the short term, since once governments rely on this tax, they will want more and more of that revenue, not less. And citizens benefit since they then obtain more energy as fracking becomes a real revolution, paid for by Mother Earth. Really shows the picture. Pushing forward on reducing CO2 levels and taxing people and Industry into compliance now looks doubly stupid (and it looked hugely stupid before). These graphs need to be out and about where everyone can see them. Great article, Ed. In Europe we already pay a large carbon tax, particularly on vehicle fuel, some 75% of the cost is tax. Taxing domestic electricity and heating and transport will not lead to a reduction as these needs are to a large extent inelastic. You pay 15% tax on gas in the US ? we pay 75% tax in the EU, it hasn’t reduced demand, people still have to get to work. To help fund the left’s war on prosperity. The futility and dishonesty in state and local policies to reduce emissions is even more egregious as they divert local resources away from real community needs and into the rat hole of deceitful government dysfunction. Keep focusing on gradual efficiencies, and perfecting the creation of CO2 and you get a cleaner environment. Every process should focus on minimizing CO and maximizing the CO2 percentages. Could someone, perhaps Richard Tol, explain to us why the world needs carbon taxes to limit emissions in the following scenario: When the equilibrium climate sensitivity to 2 x CO2 is in the range 1.3 to 1.9 deg C as is indicated by the most authorative recent research on the topic? If the transient sensitivity is in the range 0.8 to 1.5 deg C and if the equilibrium sensitivity takes several hundred years to reach its full impact then why would be bother with the tax. Surely adaption is the only sensible option. Cold someone please point out where am I going wrong on this topic? I thought the whole climate change thing was a nett positive untill we got to 2 deg C of warming. Again, please let me know where my point of confusion lies. J. Martin: “You pay 15% tax on gas in the US ? we pay 75% tax in the EU, it hasn’t reduced demand, people still have to get to work.” I sympathize with you over there. I drove around the UK in 96 and was shocked at how much it cost. Regardless, I think the idea of imposing a carbon tax on top of that would prove once and for all that government is gluttonous and intent on hurting people economically for the benefit of their bureaucracies. If you really want to reduce taxes, you should reduce taxes. Period. The only way to reduce taxes is to reduce the size and scope of government. It simply won’t happen otherwise. And that isn’t going to happen anytime soon. There is almost no mainstream support for libertarian principles today. The middle classes are being forced to abandon their traditional fiscally conservative values. They are getting to keep a smaller and smaller proportion of their steadily falling incomes. So, they have little choice but to join the entitlement class and grab whatever handouts they can get to help support their families. I think it’s inevitable that most of us are headed for a Government plantation of one kind or another. Dec 2012: Sydney Morning Herald: Smart meters, but at whose expense? THE introduction of smart meters in Victoria may have been a costly exercise for consumers but it has proven an impressive money spinner for a handful of Australian entrepreneurs. Cameron O’Reilly, the scion of the Heinz food empire and former chief of media group APN, along with John B. Fairfax, the Smorgon family and Kerry Stokes are a few of the high-profile names to have made a killing from the sale of smart meters. They were major shareholders of Landis + Gyr, the company that amassed about 56 per cent of the market in deals to supply the electricity distributors in Victoria. Their big payday came in 2011 when O’Reilly sold Landis + Gyr to Toshiba for $US2.3 billion. The “green scams” which is what the ‘carbon’ tax is planned to be spent on, has unintentional consequences, in addition to wasting money with almost no reduction in CO2 which makes no difference as the majority of the warming in the last 70 years was caused by solar magnetic cycle changes rather than the CO2 and as the planet has started to cool due to the interruption of the solar magnetic cycle. I would highly recommend Robert Bryce’s book “Power Hunger: The Myths of “Green” energy and the real fuels of the Future. The following are a couple of quotes from Bryce’s book. The developing countries are being duped by China and following the EU off of an economic cliff. The green scams do not significantly reduce CO2 emissions in the developing world. The green scams do result in a massive loss of jobs. The loss of well paying jobs in the developing world is the crisis, not the idiotic EAGW crisis. The path that we are on will lead to the collapse of the US, the EU, and all developing countries that following the AGW madness. China has a monopoly on rare earth elements and is using that monopoly to exploit the developing countries. We are losing the economic war. China has high tariffs on rare earth materials for export to force manufactures to either close or to move manufacturing to China. In addition China subsidizes China manufacturers to bankrupt competing foreign companies. In the Netherlands, we already pay a large amount of tax on all utility supplies. Electricity, methaan, water, waste water, waste, everything is taxed. The only thing that is NOT taxed is the air that I breathe. Waait, that was a bad remark, might bring someone to An idea. Silly me. Why do people want to reduce our co2 emissions? We need to get the ppm up to a nice and healthy 600 to 800ppm. Geologically we are at the low end of co2ppm in the atmosphere. Increase taxes for carbon? Really? In 2012, taxes in Canada represented on average 39.3 cents per litre, which is approximately 31% of the pump price. The same applies to most western democracies – taxed to the eyeballs! And you want added tax on carbon? Carbon taxes are a non starter! You show me how 400ppm CO2, mathematically, seals heat in and refuses to let it escape – that I have to see! Then you tell me exactly what part is man made and what part is natural. Before I talk about taxes, I would like to note that carbon dioxide emissions are a net benefit to the planet. In British Columbia, Canada where I live, we have a so called revenue neutral carbon tax. Its purpose is supposedly to reduce consumption of fossil fuels. I suspect that the current government of B.C. knows that global warming / climate change is a scam, and is using the Prime Minister Stephen Harper strategy of pretending that they still believe what the MSM (except the National Post / Financial Post) say. B.C. is going ahead with its LNG plans, which will increase emissions, putting the Michael Campbell, the former premier that introduced the carbon tax, legacy at risk as one TV reporter pundit put it. Increasing taxes doesn’t necessarily increase revenues, as the Laffer curve easily shows. One thing often missed about the Laffer Curve is that less than optimal tax revenue will be more optimal for long term growth. When pundits say that future governments might have to increase taxes to pay for expenses such as pensions, what they should be saying is : Taxes Should Be Decreased, to pay for such and such. I recall a story about a visitor to the U.S.A from Norway, a country considered wealthy because of oil revenue. Her observations that there were many new cars on the road in America and other observations in contrast to her home country such as how expensive it is to eat out for lunch in Norway. Taxes are high enough to cause people to just bring their own lunch to work. B.C. not too long ago had a socialist government in power, its leader at that time remarked that they could do anything, tax anything, that kind of rhetoric, what’s yours is ours, because of course they were the ones in power. The following election they were decimated, several times over, and were left with only 2 seats in the legislature. That premier by the way was hired by the multi-billionaire Jim Pattison to help run his empire. A word to current politicians : Be careful of what you do, you risk undermining the rule of law. “The green scams do not significantly reduce CO2 emissions in the developing world. The green scams do result in a massive loss of jobs. The loss of well paying jobs in the developing world is the crisis, not the idiotic EAGW crisis. The path that we are on will lead to the collapse of the US, the EU, and all developing countries that following the AGW madness. Hey, it’s not an economic war. Nobody holds a gun to your head and says, buy that made in China iPhone. As to the rare earth prices, they continue to fall again after the US reactivated the Mountain Pass mine and other projects are underway, breaking the monopoly of China. What WILL happen is a currency crisis, caused by indebtedness and the massive increase in money printing. The winner will be the one with zee Gold, that’s why China imports record amounts, they have millenia of experiences with Fiat currencies going into hyperinflation, they invented it. That the resource misallocation due to investment into rather useless contraptions like solar and wind contributed to the indebtedness and slowed the economies of the West is obvious. Look at how Japan’s trading balance went to hell after switching off the nukes. Energy prices are important. There are ‘rich’ people who fear a well educated middle class…. “There has been a very rapid escalation of Chinese CO2 emissions since the year 2000[iv].” it’s no coincidence that China entered the World Trade Organization in 2001. Reduction in manufacturing in the US to China is the main reason the US is down in CO2 emissions, while China is skyrocketing. Death by China is an eye opening documentary. Despite 1/3rd of ALL manmade CO2 emissions since 1750 made over the past 17 years, the (RSS) global temp trend since October 1996 has been -0.000C/decade and for HADCRUT4, global temp trends are: from January 2001, -0.02C/decade and since January 2003 (-0.05C/decade). Could someone please remind me again why the West wishes to destroy their economies by implementing debilitating CO2 taxes and draconian CO2 emission regulations? Oh, yeah, right… to save us from catastrophic global warming…that’s not happening.. Got it…. The true irony of this CAGW fiasco, is that China just started their Liquid Fluoride Thorium Reactor program (LFTR) in 2011 and recently announced their first test LFTR goes on line around June 2015. This means China should have a viable large-scale commercial LFTR program in place by around 2025; perhaps sooner. Had the West implemented a LFTR program 20 years ago, we’d already have a substantial amount of cheap LFTR energy (at about 1/5th the cost/watt of wind/solar) and CO2/REAL pollution emissions would be in decline, with vastly improved economic efficiency. Moreover, we could have saved $trillions that Western governments wasted on CO2 regulations, solar/wind subsidies, large-scale wind/solar projects, CO2 taxes, etc. Historians will not treat this generation kindly for their CAGW folly. “Canada, Japan, Australia have woken up, we still sleep walk and they still impose carbon taxes.” Not quite here in Canada. The Liberal provincial government of British Columbia brought in a carbon tax. It’s an economic mess. Schools are forced to pay the tax to heat their buildings. Federal Liberals and the socialist NDP would bring in carbon taxes should they ever form government. Dont count us a sane just yet. Rivers of tax dollars flowing in random fashion, are a joy to the Kleptocracy, that has evolved from the inbreeding of politicians,media,bureaucrats and NGOs. A carbon tax is the Emperor’s New Clothes rewritten for the 2010s. An unmeasured item, taxed and traded,small amounts of the theft remitted to the citizen and so the money flows. Each transaction must be audited through our bureaus, each time a cost of handling fee must be collected, but its “revenue Neutral”. A more primitive citizen,would call this a scheme to rob the many, to enrich the few. Then there is the magic gas, that must not be emitted. Obviously there must be two species of the amazing CO2, the chart of emissions above, show that as Chinese emissions came to dominate the world emission race, the temperature flattened and now shows some indication of cooling. So does China get a negative carbon tax? Or is any scheme from the UN best buried in an unmarked hole in the dark of the new moon, the messengers hunted from civilized lands and the bastion of darkness embargoed by all free nations? The parasites have grown entitled to their entitlements, have no comprehension of the drag they are on free societies and will not become productive members of society voluntarily. “…. if you want to increase taxes, you should increase those taxes that are currently low (e.g., a carbon tax)…. Surely a tax is a tax is a tax is a tax …. and the effect of them upon the economy is additive. Thanks for the cartoon. God is on the side of the largest battalions, evidently. Leave the scroll bar in, it works! No, Australia has not woken up, still very much asleep at the wheel. Most people polled after the election still believe that the way to tackle “climate change” is some form of tax on “carbon” or an ETS. Australia still has a, as Gillard (Who now lives in a very posh AU$2mil SEA FRONT PROPERTY and clearly, like Gore and Flannery, not at all bothered about sea level rise) would say, “proice ohn cahbon”, which is now AU$24.15/tonne CO2 with 10% going to the UN. Last year that was esitmated to be AU$800mil. For the current govn’t to repeal the tax (As well as te mining tax which generated ZERO $$’s in revenue) it needs support from the Senate. That won’t happen until the new Senate is installed in around June 2014. Abbott has stated that the carbon tax will go, but if he does not get support in the Senate he go to a double dissolution election. This would be very risky for Abbott as he would very likely lose. Qantas announce ~1000 jobs to go. Ford announced a few months ago that it will staop making cars in Australia in 2016 citing labour and energy costs as factors in the decision. GM Holden has just announce it too will stop making cars in 2016 leaving Toyota (Was given a ~AU$75mil handout in 2008 I think it was) the only car maker in Australia. And yet we still have people who believe that reducing the ~1.5% (Australian emissions) to the ~3% (Annual human total) of ~400ppm/v CO2 is going to stop the climate from changing. The mind boggles! No. Different taxes have different impacts on the economy, unless the economy is a linear system. That implies that, for any given level of overall taxation, there is room to optimize the rates of different taxes. Generally, a mix of high taxes on some things and low taxes on other things is not wise. I’m fine with the article but the old meme is still in the brains (not in the data or graphs! ): India is not at all in the league of China regarding emissions. I don’t care if it wanted to be but it isn’t. India today is one of the least polluting nations on Earth, also per head. 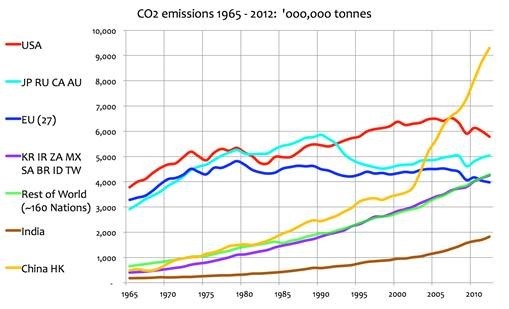 China is one of the most polluting countries today: a producer of some REAL CO2 (and other emissions) hockey sticks. This is barely mentioned by the Greens as they don’t want to embarrass their old “comrades” who also have become powerful and antagonistic towards any criticism. Conclusion: India should not be bracketed with China in the emissions field. Conclusion: CO2 IS NOT POLLUTION! …why do we need a carbon tax, because up to 80 percent of our energy is wasted through inefficiency, because renewables can be cheaper than gas or coal, because change drives innovation and economic growth. Because carbon taxes work. Our carbon tax in Australia was able to achieve a 6% cut in emissions across the electricity sector ( the only sector fully covered by the tax ) with an effect on inflation described as virtually imperceptible by our bureau of statistics . Oh and because human induced climate change is a real and present threat. Don’ take my word for it go out and read as much as you can – start with the NASA and NOOA websites – they’re clear readable, on the whole non-alarmist – don’t spend too much time with the IPPC reports -they have their moments but are statistic heavy and often nobbled by bureaucracy and politics – stick with those who are doing the research, then make up your own mind. You fall into the usual trap of quoting our CO2 production in tonnes. This takes no account of natural producers. If total annual CO2 production is 100% we produce 3% of that total. So whatever we do will be swamped by nature. pay more taxes than citizens getting the electrical power from natural gas or by nuclear energy. Is reasonable to do this? Assuming it did this. Carbon tax is fundamentally a regressive tax. by the poorer people is spent toward such things as electrical power and gasoline costs. people might inhibited from using energy because it’s more costly. So a group of people who lower capita energy used could forced to use less energy and individuals have very high energy capita usage are not going to notice the difference in costs- it’s significant, if was anyway close to significant they would not currently be using so much energy. It would be way to tax people who making so little income that they too poor to pay much in direct taxes [though indirectly they are pay plenty of taxes- indirectly the poor are currently over taxed]. be taxed. It also effectively taxes anything imported. tax continues this ratio, and replace one system of taxing income with taxing consumption. And since everything made uses energy if tax all consumption, you are effectively taxing carbon use. This would be tax revenue neutral. But the idea that giving govt more wealth does not resolved any the problems you listed, as the governments are simply spending too much. And give government more money will address the obvious problem that government simply can’t control their spending. Surely the elephant in the room here is why the USA is over twice as inefficient in energy use as the EU for a substantially similar quality of life? CO2 tax: Yea, it’s another way to redistribute money (wealth), but more important. it gives agencies like the EPA more power to control. Control by unelected elites. ” So a group of people who lower capita energy used could forced to use less energy and individuals have very high energy capita usage are not going to notice the difference in costs- it’s significant, if was anyway close to significant they would not currently be using so much energy. In other words, it is a way to keep the poor shackled in socialism and poverty. When are your marginal energy is being used to survive, climbing out of poverty is a much harder task. Maybe is has something to do with the fact that the US is like 3000 miles wide…. …why do we need a carbon tax, because up to 80 percent of our energy is wasted through inefficiency, because renewables can be cheaper than gas or coal, because change drives innovation and economic growth. You obviously suffer from CAGW Belief Syndrome (CBS), which is characterized by a complete disregard of facts or knowledge. It is curable, although your case seems a particulary virulent one. What you need to do is to examine each of your Beliefs thoroughly, with an eye toward what is actually true, not simply what you want to be true. This is where sites such as this one can be very helpful. Or, you can simply wallow in your own supreme ignorance. Your choice. No, not really. It’s a nice myth, though. You can’t compare energy use from country to country, as it’s apples to rutabagas. Also, increasing ones’ “energy efficiency” is only good if it lowers the cost of that energy. And remember, the cost includes government giveways, like subsidies, rebates, etc. @Bruce: Let’s take a black box approach, ignoring the internal cost of energy. Some economies deliver quality of life ‘x’ with energy consumption ‘y’ and some require ‘2y’. Surely it is reasonable to ask why, and whether it could be improved, given that energy generation in almost any form has unwanted side-effects? On another point, do the CO2 figures given included embedded energy costs in goods? I suspect the G8 have quite successfully outsourced a pile of their energy consumption to the Far East in the form of imported goods. And on whose budget to the transport costs of imports appear? Politicians insist that they tax behaviour they wish to discourage, for example tobacco consumption, booze and in this case burning of carbon rich fuels. I guess this means they also wish to discourage production, productive work and creative effort, as these things are now taxed at an ever increasing rate. Income is another obvious behaviour government wishes to discourage, so do we need a carbon tax? That depends on wether you are a maker or a taker. A better document to justify putting Pachauri in a court of law (assuming you don’t believe in lynch mobs), I never read……..
It’s your website Anthony, so do what you will, but I come here for the science. If I wanted Tea Party paranoia and outrage, I’d be watching Fox News instead. You have frequently accused others of framing loaded questions. With respect, the title to this post is just one such and reveals a politically-motivated confirmation bias. For instance, you assert that the decline in carbon omissions in Europe ‘is attributed to their declining economies’ without supporting evidence. However, one might reasonably conclude this data alone supports the proposition that carbon tax ‘works’ in reducing carbon emissions. Indeed, it may support a number of other theses other than that carbon taxes = communism = the end of civilisation as we know it. I am an AGW sceptic from New Zealand. My politics are (evidently) far removed from your own, but we obviously share a common interest in this particular field of science. Again, it’s your website, but I would enjoy my (frequent) visits to your website far more if the discourse here were confined to the lingua franca of data and science and avoided the US-centric political partisanship with which all of the bewildering comments above are presumably concerned. US cars are on average less fuel efficient than EU cars, some older pickup trucks so beloved of many in the US only get 10mpg (US gallons), at the other extreme in the EU some medium size family cars are now pushing 90mpg (UK gallons), some of this achieved through braking energy capture. They already know the next generation of engines in 4 years time will be a further 15 to 20% more efficient. US houses are on average much larger than EU houses so cost more to heat and cool, though I would suggest they are also often less well insulated as well. My guess is that US energy consumption per head will fall slowly and come more in line with that of EU countries eventually. I would say that the europeans do not have the quality of life we have. And that is your first assumption that is wrong. Why do we have to lower our quality of life to meet european standards anyway? The EU is rolling out Agenda 21, reducing income and destroying the middle class to undermine the consumer economy. Nothing more, nothing less. James @11:08, what part of “Guest Comment” escaped your attention?